On Valentine’s Day, there’s nothing more romantic than enjoying a cozy dinner with your loved one in the intimate setting of your own home. That’s why Joseph’s Classic Market is encouraging you to skip the hassle of choosing a restaurant this year and instead, take advantage of a speciality dinner prepared in-house by our Executive Chef. Begin your Valentine’s Day evening by sharing a plate of fresh and flavorful tomato bruschetta over crostinis. Then move on to a warm and creamy lobster bisque soup, followed by a fresh garden salad with lettuce, tomatoes, cucumbers, olives, peppers, and onions. 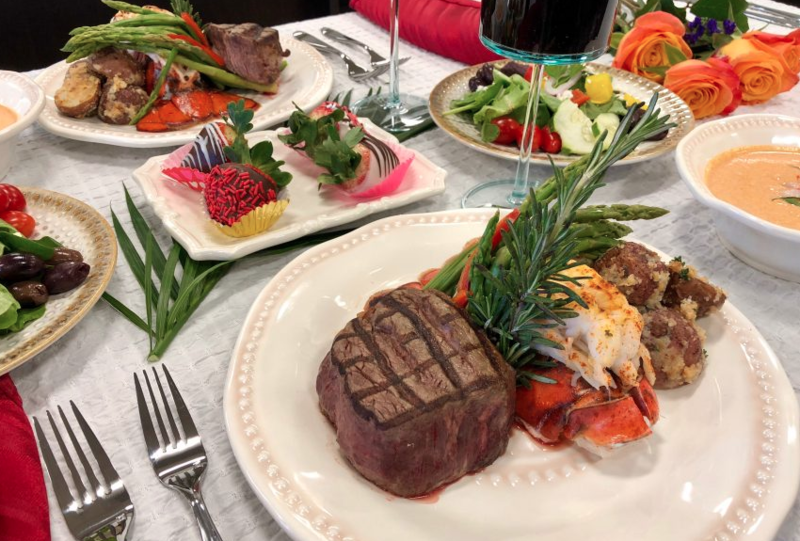 For the main dish, enjoy top notch lobster tail and filet mignon, with a side of roasted rosemary potatoes and fresh asparagus. To top it all off, enjoy the most romantic dessert there is—delicious chocolate covered strawberries. Each and every dish mentioned above will be fully prepared by us here at Joseph’s Classic Market and ready for you to pick up at your convenience. And to enhance the night even more, you can grab some wine, flowers and chocolates on your way out to show your special someone just how much he or she means to you. Order your Specialty Valentine’s Day Dinner in Palm Beach Gardens or Boca Raton! You can get this 5-course surf & turf dinner for only $49.99, so don’t miss out! Give us a call today to get your order in and you won’t have to worry about a thing this Valentine’s Day. Phone Call Orders: For Boca Raton, call (561) 347-2314. For Palm Beach Gardens, call (561) 799-0322.